37. What is Spirituality? How Spiritual are You? Explain that some thinkers such as David Hay have written about Spirituality in terms of ‘relational consciousness’. Hay argues that spirituality involves an intuitive, experiential awareness. Spirituality is something that we feel more than understand in an intellectual sense. From interviews with children, Hay came to the conclusion that much of what has been thought of as ‘spirituality’ is actually an awareness of being in relationship with some larger reality. What do you think it means to be spiritual? Is being spiritual the same as being religious? Some people talk of atheist spirituality; what do you think this means? 3. Explain that ‘Spiritual growth’ is seen by some as a developing awareness of the self; an understanding that there is more to life than meets the eye and a sense that there are deeper truths within reality (some may call this God or The Ultimate). In his book, The Different Drum, psychologist Scott Peck sets out what he calls the Four Stages to Spiritual Growth. Share the following diagram with the students, and give them some time in twos or threes to read through the four stages and discuss with each other the main ideas. Do you think these stages make sense? Do you think people can really progress from stage 1 to stage 4 in this way? Do you think any of the stages describe where you are at this moment in time? Explain that, when people convert to a religion, they often experience an enormous sense of elation and joy. This may be seen as the transition from stage 1 to stage 2; from chaotic to ordered. They discover a set of patterns and answers which seem to make so much sense, e.g., the Bible, Qur’an, etc may seem to give very clear guidelines for life. Evangelical Christians may see this as a liberation; the person has been saved, literally freed from their sins. But if a believer begins to question their own beliefs, they may be made to feel that by beginning to doubt they are losing their faith (evangelicals call this becoming a ‘back-slider’!). 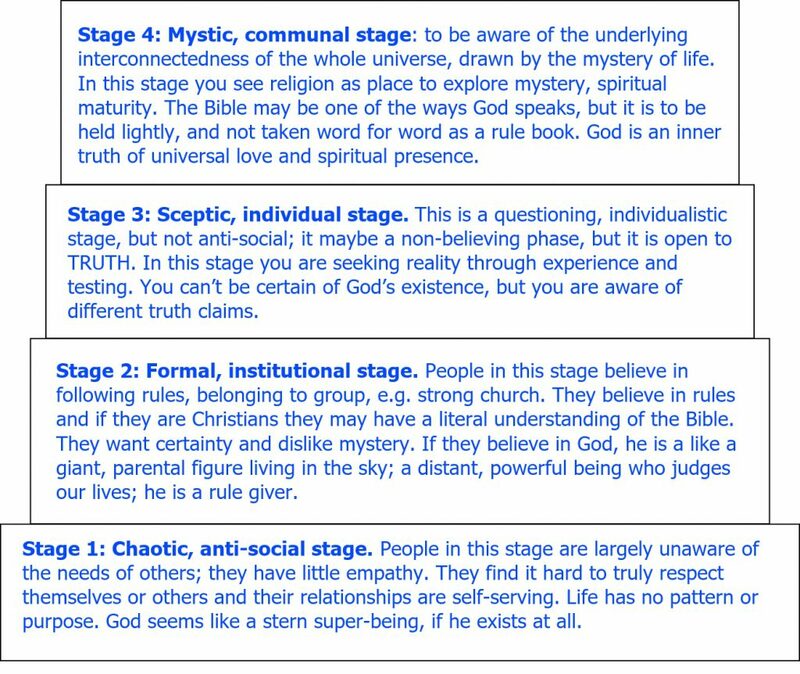 However, according to Scott Peck’s theory, rather than seeing them as moving backwards, he says that they may well be moving forwards from stage 2 (formal religious) to stage 3 (open and questioning). Asking questions takes you closer to the truth. Ask the students for their final reflections for the session: What is spirituality? And how ‘spiritual’ do they see themselves?